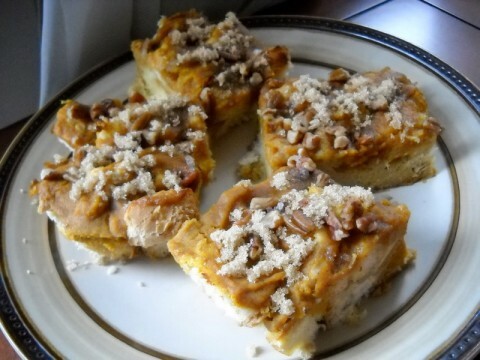 NOW (November 12, 2018) – I can’t even fathom the number of times I’ve made this recipe since I originally posted it in 2010. It has remained a huge family favorite the past 8 years. We especially love it as a breakfast-for-dinner meal. I now make two batches every time I make it so that there plenty to go around with some leftover for busy school mornings. Isabelle will be coming home for her first college holiday break for Thanksgiving and I am already planning to serve this Pumpkin Pie Baked French Toast for breakfast while she is here. It’s going to be an exciting visit for us all. We haven’t seen her since we dropped her off at her dorm at the end of August and we can’t wait! It will be her first time at our new house, and the kids are ready to take her on a grand tour. I’m also looking forward to cooking some of her favorite meals for her. She’s requested a few things that she’s been missing, so it will feel good to be able to do that for her. THEN (November 4, 2010) – I think I am officially a pumpkin convert. When I shared the recipe for Pumpkin Pasta Sauce, I admitted to not being a huge fan of pumpkin. However, I’ve been using it more and more the past few weeks and I’ve definitely taken a liking to it. I’ve enjoyed it in both sweet and savory preparations. For eating, I’m learning to value it’s earthy, seasonal flavor and for cooking, I’m a huge fan of its versatility. 1. Grease a 13×9 casserole dish. Place cubed bread in dish. 2. 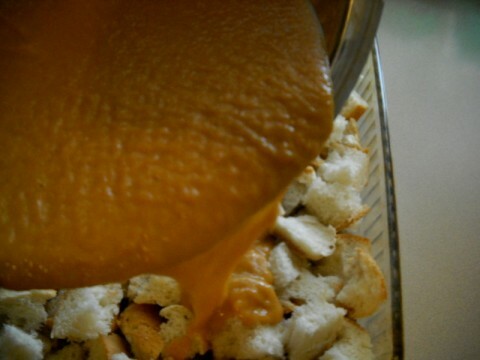 In a bowl, combine pumpkin puree, eggs, milk, brown sugar, vanilla and seasonings. Whisk until smooth and fully combined. Pour on top of the cubed bread. 3. Refrigerate overnight or at least 6 hours. 4. Bake at 375 degrees for 25 – 30 minutes, until lightly browned and set. If desired, sprinkle pecans and brown sugar on top of the baked French toast 5 minutes before cooking time is finished. The baked French toast is so full of flavor that it does not need any syrup at all. It’s perfect served as is. Also, I listed the garnish as optional because it’s not needed for that great taste. However, both my husband and I agree that it really enhances the texture, so much so that my husband feels it’s a necessity. I am not yet ready to give up all this pumpkin eating that’s been going on in our kitchen. So if you have any great pumpkin ideas or recipes to share with me, I’d definitely love to hear them! I am making this tonight so that we can enjoy it for breakfast tomorrow. It looks so yummy! Years ago, I saw a show on Food TV where they made pumpkin risotto. I didn’t save a recipe, but learned enough of the technique and principle. I already knew ‘risotto 101’ and was able to “riff” with it. Project was a success. Looks so incredible. I am printing it off right now. Sounds great for Sunday brunch. This looks lovely! Do you think it would freeze well? I’m trying to feed the freezer before BabySister arrives. In the fridge for tomorrow morning’s MOPS meeting… can’t wait to hear how everyone likes it! Thanks for sharing! 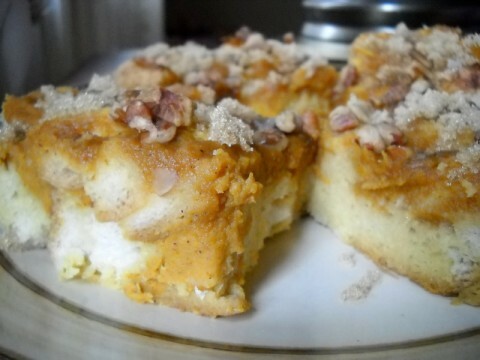 I made this for breakfast this morning – HUGE hit!! (I did a half recipe since there’s only 2 adults and a 2 year old). I added a little ground ginger and the zest of 1 orange, and cut back on the sugar. And you’re absolutely right – the topping is NOT optional. It was my husband’s favorite part.